The reviewers and scientists had several discussions with various farmer groups during the field visits. 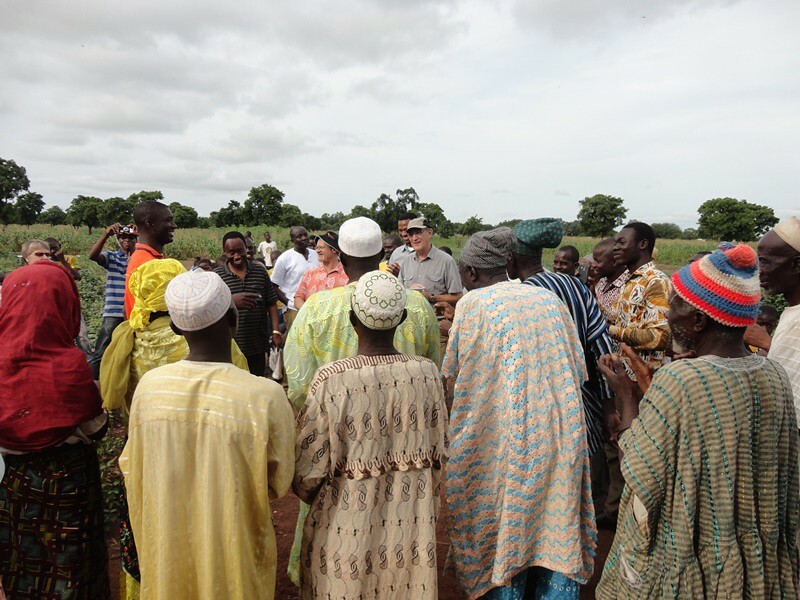 In this photo, Dr. Kwaku Agyemang (left of center, in stripped tee shirt), Dr. Kenton Dashiel (IITA’s Deputy Director General for Partnerships and Capacity Development) and Dr. Jim ElliS-Jones (right of center) engage with farmers in Northern Ghana. The West Africa component of the Africa RISING program recently underwent an IITA-commissioned external review of its activities in Mali and Ghana. The review began in early September and comprised a team of 3 independent external reviewers. The purpose of the review was to assess conformity of the implemented work with the research framework developed for the program level. It was also expected that the review will provide recommendations on management of the project, staffing, as well as the partnerships for achieving the project objectives. The team is currently working on the final report having completed 3 weeks of field visits, face to face meetings with project partners and leaders, as well as discussions with IITA senior management. A debrief meeting between the reviewers, the IITA senior management and project staff where preliminary outcomes of the review were discussed was held on 17 October at the IITA headquarters in Ibadan. Most of the ongoing work within the project has been commended by the reviewers in their preliminary report. “There is a lot of great work going on in the project! We enjoyed the technology parks in Ghana which are great sites for research, training and demonstration. 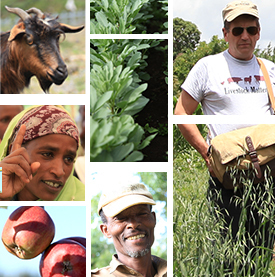 We were also quite impressed by the interaction between the researchers and the farmers,” said the lead reviewer, Jim Ellis-Jones at the end of the debrief meeting. 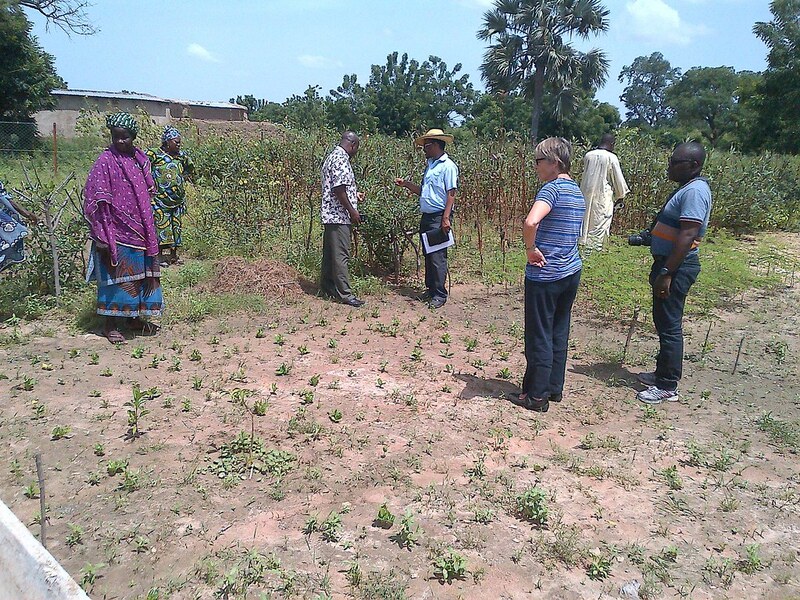 Two members of a women farmer’s group in Mali showcases a trial site experimenting on intercropping nutritious trees and vegetables. Looking on is one of the external reviewers, Dr. Christine Okali(Photo Credit:IITA\ Jonathan Odhong ). Also speaking during the debrief session, Dr. Kenton Dashiell, IITA’s Deputy Director General for Partnerships and Capacity Development thanked the review team for their dedication and effort. He also congratulated the Africa RISING project staff for a well organized review as well as for making the review process transparent. The final report of the review is expected to be ready in mid-November. The Project Coordinator, Dr. Irmgard Hoeschle-Zeledon believes that the outcome from the review will be useful for the project leadership to improve Africa RISING West Africa.